Little Big Town is Giving Us Summer Fever! Little Big Town Suprised by RIAA with 2x Platinum Plaque for "Girl Crush"
LITTLE BIG TOWN SURPRISED BY RIAA WITH DOUBLE-PLATINUM PLAQUE FOR GRAMMY AWARD-WINNING HIT, “GIRL CRUSH” Photo ID L-R: LBT’s Karen Fairchild and Jimi Westbrook, RIAA EVP Public Policy & Industry Relations Michele Ballantyne, LBT’s Kimberly Schlapman and Phillip Sweet Photo Credit: Becky Fluke NASHVILLE, Tenn. (April 11, 2016) – Prior to their performance at Baltimore’s Royal Farms Arena Friday night, the GRAMMY Award-winning group Little Big Town received a surprise visit from the Recording Industry Association of America (RIAA). 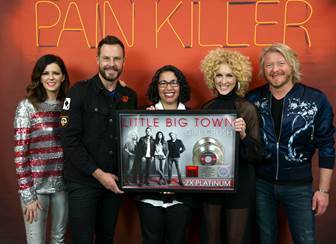 Little Big Town’s Karen Fairchild, Kimberly Schlapman, Jimi Westbrook and Phillip Sweet were presented with an RIAA Double Platinum certification plaque celebrating their smash hit, “Girl Crush.” “Girl Crush,” written by Hillary Lindsey, Lori McKenna and Liz Rose, landed on multiple year-end “Best of” lists and was the most downloaded country single of 2015. It garnered two CMA Awards (Single of the Year and Song of the Year), was nominated for GRAMMY Song of the Year and earned the title of GRAMMY Best Country Song. The group also took home a GRAMMY for Best Country Duo/Group Performance for the record-breaking tune. “Girl Crush,” the second single off Little Big Town’s Gold-selling sixth studio album PAIN KILLER (Capitol Records Nashville), remained at No. 1 on the Billboard Hot Country Songs chart for 13 consecutive weeks, setting the longest run in the top spot for a group since 1959. To preview and purchase “Girl Crush” and Pain Killer, click HERE. 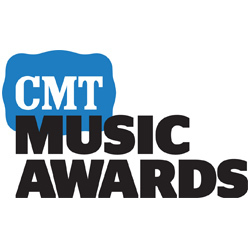 Little Big Town is the three-time, reigning ACM Vocal Group of the Year, the four-time, reigning CMA Vocal Group of the Year, and was recently awarded with the ACM Crystal Milestone Award. Little Big Town is currently on the Kill The Lights Tour with Luke Bryan, with upcoming dates in Toledo, Ohio; State College, Pa. and Charlottesville, Va. For more information, please visit www.LittleBigTown.com.